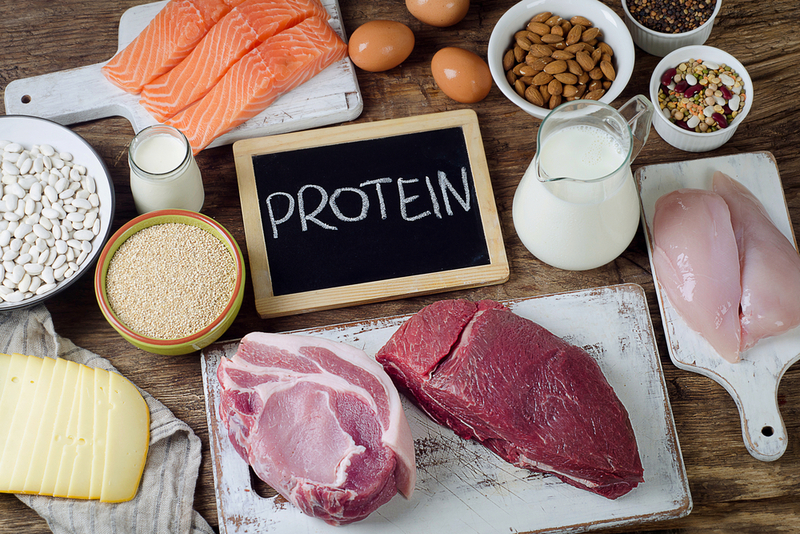 It's no secret that eating adequate protein is critical for building muscle, but what else does it do? Protein is the second most common type of molecule in the human body behind water, and every cell in your body requires protein to function. When you don't eat enough, your body conserves protein to protect its vital organs and lets less essential parts of your body break down. Imagine you are building a house, but you run out of wood halfway through, so you build a kitchen, bedroom, and bathroom. You skip the living room and guest room because you can live without them. That's what would happen if you stopped eating protein. Your body would first protect your brain, heart and essential organs. As awesome as it would be to eat chocolate and cheesecake three meals a day, you need to include high protein foods in your diets to help replenish the protein that's broken down in your bodies every day. In the USA, the daily recommended amount of protein is at least 0.36g/lb of bodyweight. People who are highly active may need as much as a 1g/lb of body weight to help repair muscle damage. For example, a sedentary person who weights 150lbs needs at least 54g of protein a day while somebody who works out regularly may need up to 150g. Protein is critical for keeping your skin elastic and looking healthy. The protein called collagen makes up 30% of all the protein in your body and plays a particularly important role in giving your skin structure. If you are protein deficient, your skin is one of the first parts of your body to suffer. People with anorexia who eat low levels of protein often have pale or dull looking skin. As nice as it is to have glowing skin, your body gives priority to keeping your heart ticking. Both hair and nails are made primarily of a protein called keratin. Like your skin, hair and nails often break down quickly when dietary protein intake is too low. Hair becomes thin, wispy and falls out faster. Also, nails become brittle and break easily. However, you can avoid both of these problems by packing an extra can of tuna in your bag. What's a little fish smell if you won't go bald? Hormones aren't just crucial for growing teenagers. There are about 50 hormones in your body that try to keep your body in balance, and without them, you wouldn't be able to survive. A group of proteins in your body, called peptide hormones, are made of protein. One of the most well-known and vital peptide hormones is insulin. Insulin is responsible for controlling our blood sugar, and your body needs it to build both muscle and fat tissue. Proteins also make up the structure of our digestive enzymes that are needed to break down food. Try to include a high protein food with each meal to get your daily recommended amount like take healthy breakfast, healthy lunch and healthy dinner. Eating healthy can be difficult when you're away from home, but foods like canned fish and Greek yogurt are easily transportable.